A brilliant triple combination, if you ask me. This cake is deliciously moist and light and tastes like a perfect muffin in cake form. And the lemon sauce? Don’t get me started, man. The slightly sweet and tart sauce is wonderful drizzled on top of the coconut-crusted cake…or just enjoyed by the spoonful. Lemon sauce makes me happy. 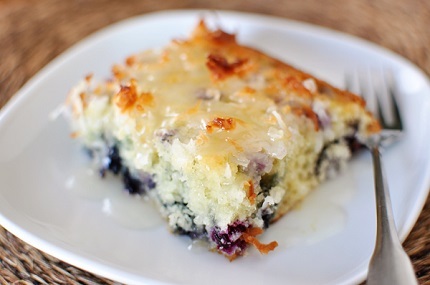 The dreamy part of this cake is that it can be made with fresh or frozen blueberries (don’t thaw those blueberries before using if they are frozen!) which makes it perfect all-year round when fresh blueberries may not be in season. This refreshing little cake is perfect, in my book, for potlucks or upcoming summer BBQ’s. It kind of fits in the category of some of these other quick, 9X13-sheet cakes that taste out-of-this-world but come together so easily. Why does life feel so complete when such a simple cake tastes so utterly terrific? I’ll ponder that question while you head to the kitchen to make this. In a large bowl, combine the flour, sugar, baking powder and salt. In a medium bowl, whisk together the eggs, milk and oil. Stir the wet ingredients into the dry ingredients with a rubber spatula just until moistened. 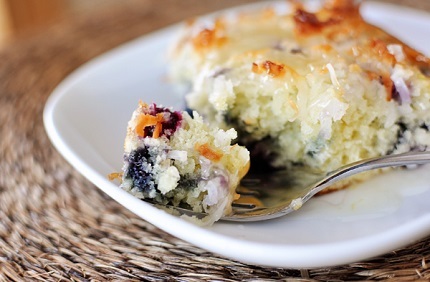 Toss the fresh or frozen blueberries with the 2 tablespoons flour and fold them in very gently to the batter. Don't overmix or the batter will start take on a blue-ish tinge.